This is the real problem in America today, the key to almost all injustices. The fact is judges are really nothing more than a lawyer who found his way to the bench. An image forced upon the public of someone with integrity, morals, empathy and fairness. The truth is its all about greed, cold hard cash and weak people who sell your family out for theirs. The problem extends even deeper to prosecutors and public defenders all who obey the bar and Commissions on Judicial Performance. Problem is they’re all in bed with each other and when it comes down to justice or them they’ll always rule in favor of themselves. It’s a gang which bans any member from exposing them. Ever wonder why Police who obviously murder people with video or audio evidence never get prosecuted? It’s because police are in bed with the courts, the entire relationship is flawed and built to fail. Police won’t prosecute the court nor will the court prosecute police. 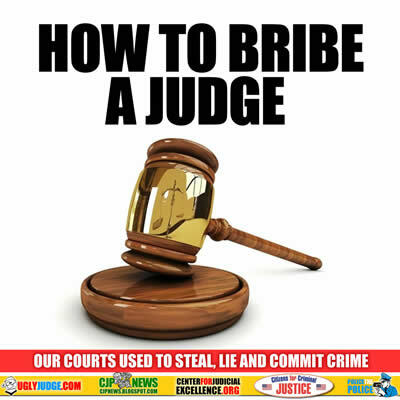 “How to Bribe a Judge” Assistance With Debt Repayment is Sure to Gain His Favor. Taking out large sums of money in the form of property loans and later paying them back is one method that a judge might employ to conceal the fact that he or she is being enriched from an outside source. When a judge’s income is inadequate to serve as the source of loan repayments, it is likely that the funds are coming from somewhere else. Are we making sociopaths into judges who seek power, greed and control? SAN BERNARDINO, CA — Several years ago, all of the county’s probate and conservatorship cases were moved to the Redlands Courthouse, and most of these cases were subsequently heard by Judge James M. Welch. Recent documents obtained by the Sentinel point to suspicious financial activity by Welch, who at one point in time was the presiding judge of San Bernardino County. Welch was featured in an article in the Sentinel on June 12th of this year in a lengthy exposé regarding questionable business practices by Melodie Z. Scott, a professional fiduciary and conservator for the elderly. Scott is President of C.A.R.E., Inc., located at 25 E. State Street in Redlands, right around the corner from the courthouse. The activities by Scott cited by the Sentinel as questionable involved giving conservatee property to her own family members, overcharges on her clients’ accounts, missing monies from clients’ accounts, selling conservatee property at bargain basement rates only to have the property jump in value and resold the next year, withholding medical care from conservatees resulting in death, and allegations of possible undue influence on judges. In 1998, Welch and his wife, Ginny, took out a loan for $217,200 on their La Colina residence, which was fully paid back in March of 2003. The reconveyance document number attached to this transaction is 2003-0173087. In February of 2003, James and Ginny Welch took out another loan on their residence, this time for $234,000. This was fully paid back by June 10, 2004, as listed in document number 2004-0410928. Another loan was taken out by the Welches on May 17, 2004, as listed in document number 2004-0353533. This loan was for $358,965.71. Messages were left with Welch’s secretary, inquiring as to where the money was going and how he was paying these loans back. The possibility that Welch was taking out loans and investing the money, then paying back the loans with the proceeds was considered and discarded. For the last seven years, Welch has reported to the Fair Political Practices Commission on his form 700 financial disclosure statements that he has no investments. A query was also left with Judge Welch’s secretary as to three property transactions recorded in neighboring Riverside County, attributed to a James Michael Welch, Trustee. Please be advised that I have received and reviewed your letter of August 11, 2009. Please be further advised that I am an administrative presiding judge and, therefore, my review jurisdiction is limited. Nothing contained in your letter is of a nature over which I would have review jurisdiction. Any request for review or investigation by me is, therefore, denied. There has been no confirmation or denial from the court as to whether Welch’s exodus from his probate assignment in Redlands had any bearing on the recent media scrutiny given his actions as a judge or his apparent bias towards cases involving Melodie Scott, who recently launched a legal protest concerning the denial of her fiduciary license by the California Professional Fiduciary Bureau. This practice of judges taking out large loans appears to be widespread and crosses county boundaries. Information gathered on Commissioner John McCoy and Judge Sharon Waters (both of Riverside County) has recently been turned over to a Riverside County district attorney investigator, Jeff Chebahtah. While Chebahtah has acknowledged receipt of the information on the Waters and McCoy loans, he has at press time refused to assign a complaint/case file number. The practice of accepting evidence and refusing to assign a tracking number has been previously explored by this reporter in an article entitled: “How the California Justice System covers up crimes against the elderly: A method to the madness” and appears to be deployed when either the matter is too trivial for the district attorney to take seriously or when there is a political agenda to keep the report out of the system and thus not to investigate at all. Parenthetically, both McCoy and Waters were recently and consecutively removed from an active case in Riverside Superior Court, following a protest lodged that the loans smacked of pay-offs or bribes. In San Bernardino County, Judge Steven Mapes ascended to the bench in 2007 and currently sits on Barstow court, following his tenure as an deputy district attorney in San Bernardino. Mapes has also been involved in the loan program, apparently going back to 1998, when he took out a loan on his home on Patricia Drive for over $155,000. He subsequently took out further loans on his property, including loans for $100,000 in 2001 and 2002, another loan for $307,500, also in 2001, one for $88,500 in 2002 and a loan in 2004 which was in excess of the value of the house, recorded at the tax assessor’s office as $427,528. This loan was taken out for a resounding $493,000. More recently, in 2006, he again borrowed money against his property. Since 2001, Judge Steven Mapes has received seven different reconveyances on his loans. From: Janet Phelan, “Judges Involved in Multiple Property Reconveyances,” The San Bernardino County Sentinel, Rancho Cucamonga, CA, September 11, 2009. Janet Phelan is an investigative journalist. She can be contacted at janetclairephelan@yahoo.com. Reprinted in accordance with the “fair use” provision of Title 17 U.S.C. § 107 for a non-profit educational purpose. We’d like to think our justices and judges are defined by respect, duty and impartiality. But behind that iconic black robe isn’t always a tireless drive to uphold the Constitution and laws of the United States. Some of the most revered judges are worse than the criminals they should be sentencing. Below we examine five corrupt judges who will make you question your faith in the legal system.